Gorgeous Macy is a young adult Whippet/Lab/Border Collie blend — what a combo! This very energetic and playful girl is full of a love for life. She has been homeless at the Delco SPCA Adoption Center nearly 90 days. 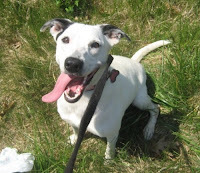 While it’s not required, Macy would love a home with a fenced-in yard to let loose in. She loves to play with all kinds of toys. Macy could live with older children and could share her home with a canine companion if the other dog is willing to let this alpha girl be the boss. She would sooner not live with kitties, though. Macy would thrive in a home where she could get some proper training to learn basic commands. Macy’s adoption fee is just $20.12 in the Delco SPCA’s “Most Wanted Beach Bums” adoption special, lasting throughout the month of June. Included in her low fee is her spay surgery, a microchip, necessary vaccinations, a complimentary vet visit and a free bag of food! Jasper is one good-looking dude. This adult Turkish Angora was brought in to the lifesaving Delco SPCA for his second chance at love when his owner could no longer care for Jasper any more because he was moving. Jasper is such a distinguished breed, with his svelte build and silky, medium-length white fur, that he stands out among the other kitties. Turkish Angoras require minimal grooming and are known as one of the most outgoing and affectionate of all cat breeds. This stunning guy is litter trained, cat friendly and good with kids of all ages. You can rescue Jasper or any of his feline friends 6 months or older for just a $25 adoption fee in the Delco SPCA’s “Felinefest,” going on throughout the month of June. Since Jasper is cat-friendly, consider bringing one of his cat pals home too in the Delco SPCA’s “Save a Paw, Get a Paw” adoption special where the second cat has no adoption fee! Hurry; this prince of felines is eager to find forever. Hours for adoption are Monday through Saturday from 12:00 p.m. to 7:00 p.m. and Sunday from 12:00 p.m. to 4:00 p.m. See an act of cruelty? Be a Good Samaritan and report it to the Delco SPCA’s Humane Investigator at 610-566-1370 x214. Delco SPCA low-cost spay/neuter for dogs under 40 pounds is $60 and $80 for dogs over 40 pounds. In the month of June, cat spay/neuters are just $35! Must mention this special. Delco SPCA also offers pet dental cleanings. Appointments can be made at 610-566-1370 x3. ** The Delaware County SPCA is in need of towels, blankets, peanut butter, newspaper and much more for the pets. Check out the entire list of items needed here. If you would like to donate anything, please take them during the hours of operation or drop them in the drop box after hours.